Let’s be honest, sometimes people are clumsy or are just a klutz. It seems to heighten, the closer they are to water. Cell phones, ring, watches, outboard motors, fishing rods, cars, and many more items end up underwater every day. In the news lately were three separate reports of divers finding iPhones that were still undamaged and were returned to their owners. We constantly hear of people finding things underwater from wedding rings, Go Pro cameras and millions of dollars in gold coins. However, these are generally random finds except the millions in gold. There are those among us that include modern-day treasure dives as a part of their enjoyment of the dive. They seek out items that may have been lost in rivers, lakes and along shorelines. Some even go as far as purchasing underwater metal detectors. While most items lost by people are small and weigh little, there are other larger and heavier items that a recreational scuba diver might want to bring to the surface. If you go beyond the things that people carry around with them that become lost, you might need help to get the item back to the surface. 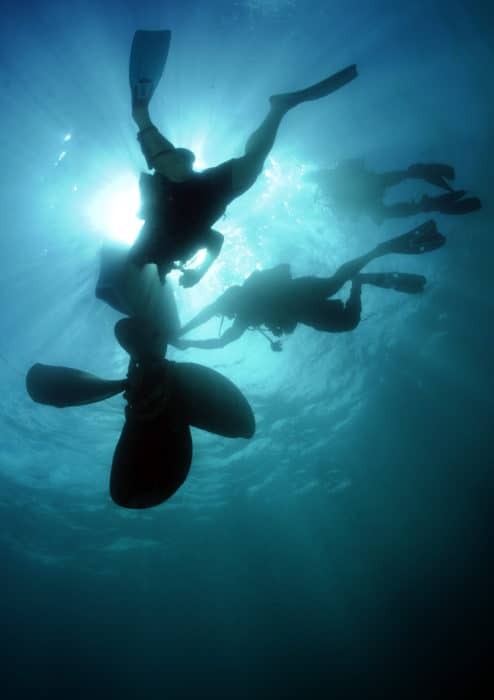 For smaller items, generally, you can adjust the air in your BCD to provide the extra buoyancy. In case you dropped the item a few extra pounds or kilograms of buoyancy will not shoot you to the surface at a dangerous pace. More than that it just might put you in a fast developing potentially fatal situation. Another factor is how much lift can your BCD provide? When your cylinder is full, you will be using air in your BCD to counter the weight of the air to maintain neutral buoyancy. The amount of buoyancy measured in pounds or kilograms will vary based on the size and designed of the BCD. It is clearly possible that there may not be enough spare lift capacity to lift another object. Once you reach around 10 pounds or 4 kilograms of weight, it is best to have the item lifted with a lift bag. The purpose of a lift bag is to provide buoyancy independent of the diver and their diving equipment. The concept and design of a lift bag are similar to that of Surface Marker Buoy (SMB) and the Delayed Surface Marker Buoy (DSMB). There are some lift bags that will also double as a DSMB. Please note we are talking about lift bags for recreational scuba divers. 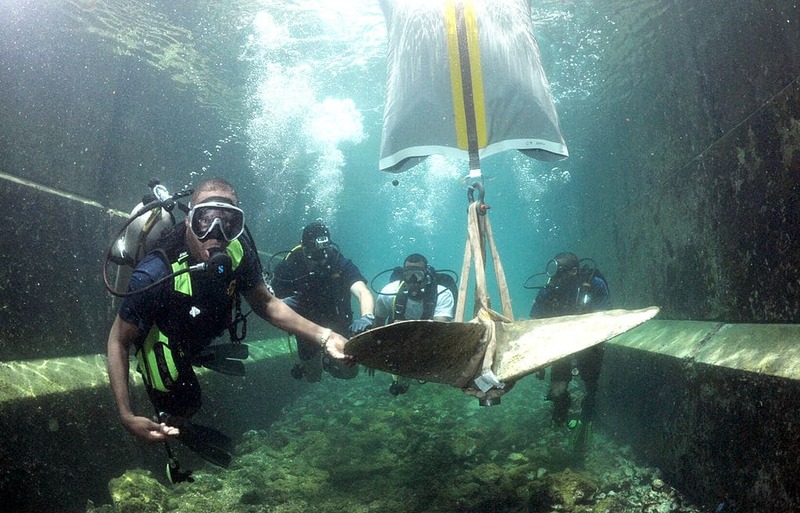 There are commercial lift bags that can lift tons, but require many more divers and systems. You secure the item that you wish to bring to the surface to the lift bag. Generally by a rope or harness attached to the bottom of the lift bag. Air is added to the bag until it becomes slightly positively buoyant. This will have the bag floating over the load. You can then slowly add air to the lift bag until the bag and load combined becomes neutrally buoyant. This will allow you to pick up the item and move it with just your fingertips. Be careful to never be directly below the item being lifted. If it became lose from the lift bag it could sink and crush anything below it. Including your head or foot. A tether line is normally attached to the load to help keep the items in position. When you are ready to send the item to the surface, you just need to add a little more air to make it slightly positively buoyant. It is perfectly alright for it to start to ascend slowly. Just like your lungs and BCD, as you ascend the air in the bag expands increasing the lift. It is important to remember that if the positive lift of the bag is greater than the negative buoyancy of the load, both will continue to the surface. If you are attached to the lift bag/load on a taut line, you become part of the load. So you might find yourself lifted as well. Once the load is headed to the surface, the divers will accompany it. One diver is tasked with controlling the rate of the ascent. If the load is rising too fast, the diver can pull a dump valve on the lift bag. The dump valves operate the same manner as the ones on the BCD. Pull a cord and air is released. Alternately, if the bag has lost some air, the diver can add a little to regain positive buoyancy. In the case of larger or repeated lifts, the air should be from a separate source from the divers breathing gas. The second diver is off to the side and is tasked with keeping the position of the load going to the right place. Currents might push the lift and load away from where you want to go. Both divers will work as a team to ensure that the lift bag breaks the surface slowly. A lift bag can also be used to help maintain depth during a safety stop. Deployed in the manner of a DSMB, a diver can allow the lift bag to reach the surface while they are at the depth of the safety stop. After making the tether line taut, the diver makes themselves slightly negatively buoyant. As long as the diver is less negative than the lift page is positive, the diver will stay at one depth. There are two styles of lift bags: the open lift bags also called parachutes, and closed lift bags also called camels. The bottom of the open bag is not sealed. The diver places the air source into the opening and adds air until the bag rises. Like an upside-down water glass, as long as the air bubble does not escape by tilting, the air will remain in place. As the air expands on the way to the surface, excess air is released out of the bottom. If upon reaching the surface the bottom of the lift bag breaks the surface, all the air will escape and lift will be lost. There are open lift bags that have baffles that help prevent the loss of air at the surface. The closed lift bags are fully sealed with a valve to allow inflation. An overpressure release valve similar in function to one on a BCD will release air so that the bag does not burst from over pressurization. Once on the surface, the position does not matter, the air will be retained. With both types of lift bags, the volume will determine the maximum lift capability. Using a lift bag requires practice. Start by learning how to deploy your DSMB properly. When you can safely do that, expand your practice to securing the object to your lift bag and then lifting them.